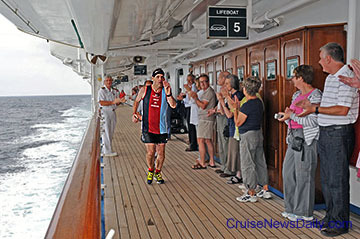 SANTA CLARITA, Calif. (September 22, 2011) – Today cruise passenger Steve Eaton completed the world’s first-ever marathon at sea aboard Princess Cruises’ ship Grand Princess with a time of 5 hours, 16 minutes and 45 seconds. Eaton, 57, who is from Tamworth, UK has run 33 marathons in the past but this was a totally new experience which stemmed from his wish to raise money for Help for Heroes, a charity that provides support to those wounded, sick or injured in the line of duty since 9/11. The race was inspired by Eaton’s family friend, Staff Sergeant Christopher Chacksfield, who was murdered in June 2010 in Newcastle upon Tyne, UK. Chris, 31, had come through tours in Iraq, Afghanistan, Kosovo and Bosnia unscathed but was killed in an unprovoked attack as he waited for a taxi with his wife, who had just returned herself from duty in Afghanistan. He left behind his wife and young daughter. Because Chacksfield had expressed a wish in his lifetime to raise funds for Help for Heroes, Eaton decided to do so on his behalf. As an avid runner, Eaton chose a marathon and asked Princess Cruises for help in an effort to run the first ever marathon at sea. 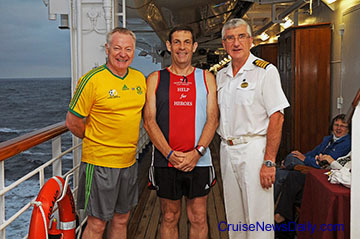 Eaton started his marathon today at 9 a.m. on a course of just over 600 meters (.37 miles) around the Promenade Deck of Grand Princess, while the ship was sailing near the coast of Portugal. He had to run 70 laps to cover the total distance of 26.2 miles. To support Eaton and Help for Heroes please visit http://www.bmycharity.com/princessrunningonwater. We often hear about the economic impact cruise ship calls have on the port cities in terms of millions of dollars. This report from a Maine television station WCSH shows you the effect cruise ship calls have on Portland (Maine) from the local perspective, and the personal stories of a couple of local merchants. Portland will have 65 cruise ships call this year bringing more than 92,000 passengers. Nearby Bar Harbor will have about 118 calls. Meyer Werft cut the first steel for Norwegian Cruise Line's first Project Breakaway ship today at their facility in Papenburg (Germany). 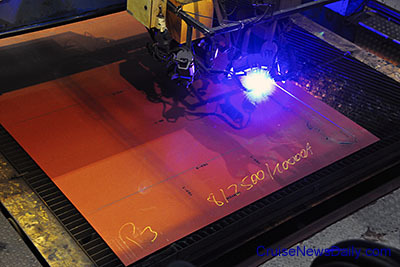 The computerized plasma torch took four minutes to cut the the plate which will become part of a support in the double bottom in the middle of Norwegian Breakaway. On hand for the event was Bernard Meyer (left), a Managing Director of Meyer Werft, and the man with his finger on the button, Kevin Sheehan, NCL's CEO. 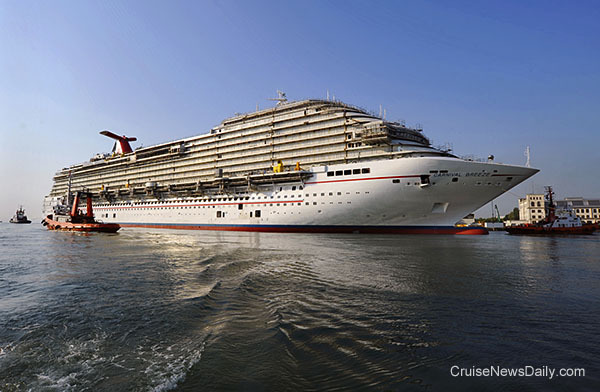 The complete story appeared in the September 21 (2011) edition of Cruise News Daily. 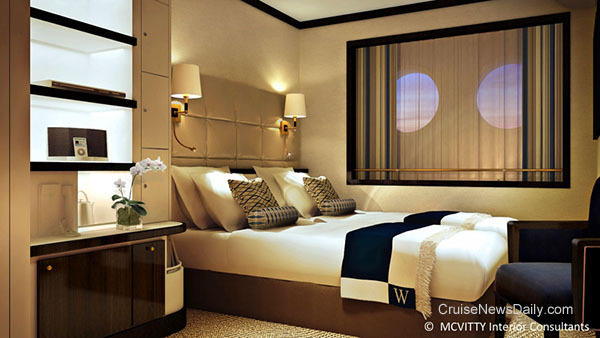 In November, Windstar Cruises will embark on a dramatic $18 million transformation of the look of their ships. The new "Full Sail Ahead" project, to be completed over the next 18 months, will give the ships the look of classic, stylish luxury yachts, compared to their current more nautical sailing ship decor. 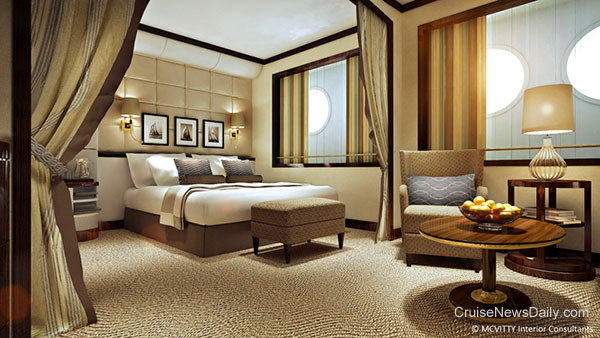 The new look can be seen in these renderings of the accommodations. (above) Wind Surf's newly refurbished staterooms. (above) The new look of the suites on Wind Surf. Each of the three ships in the fleet will be fully refurbished in all the accommodations and public rooms. 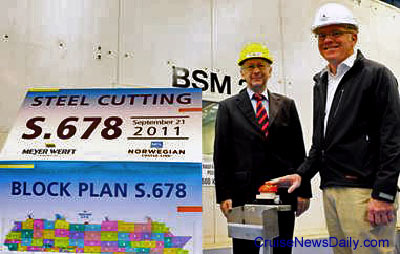 The complete story appeared in the September 19, 2011, edition of Cruise News Daily. 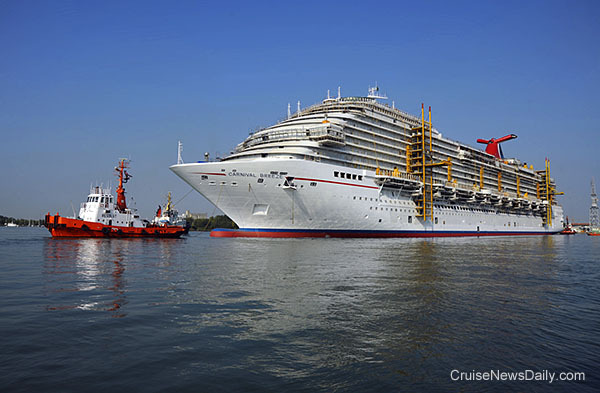 The 130,000-ton Carnival Breeze took a noteworthy step in its construction at the Fincantieri yard in Monfalcone (Italy) last Friday (September 16, 2011) when Carnival held their traditional coin ceremony, in which a coin was welded to the ship's mast for luck. Then the valves were opened and water began flooding the drydock, and hours later, Carnival Breeze was floating for the first time. The following morning, the ship was towed out to a finishing dock where it will stay while the finishing work is done on the outside and the interior is installed. The ship is set for delivery in June 2012. Photos and video are below.